Found in dark with head-lamp in leaf litter in mostly deciduous forest in north Georgia mountains at 1600'. Legs appear distinctly banded or striped. I'd guess they are Pardosa, but I'm not sure. These are great shots and I'd think the right person could ID them to species. That might take a while though. 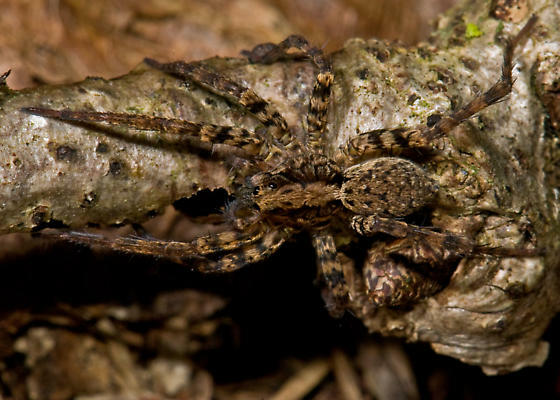 the entire Lycosidae section of the guide, and I do not think I saw anything that fit the markings well (that are fairly distinct and consistent on both spiders). I thought about Pardosa too, but I was more unsure than usual. Thanks Lynette! There are a lot of wolf spiders, many of which we may not have images of... and if we do.. it's likely we haven't placed them yet. This is a tough family. What we really need is a bunch of voucher specimens so we can start sorting all these out.